Savvy brands use dynamic product content to personalize the offers that are delivered to each customer. In Zaius, you can dynamically change entire sections of content within emails to make campaigns more relevant and appealing to customers. To create a Dynamic Grid based on a customer behavior, you must first create the behavior. The behavior will then be available as a Source when creating a Dynamic Grid in ZED. Select the Behavior from the Source dropdown. Note that adding a Feed/Source combination for a Dynamic Grid will automatically constrain the campaign to only send to those users that match the behavioral conditions. For more advanced use cases, you can select "More Options" to create custom Liquid, change the constraint requirement, and even customize the Liquid variable used for the data. Finally, preview the template to make sure it is working correctly. 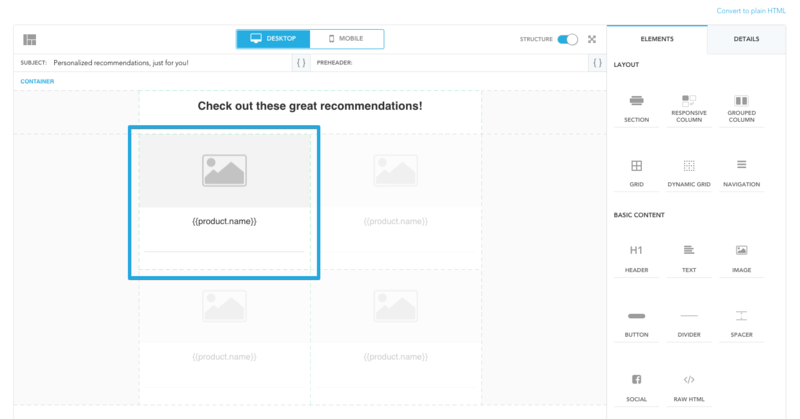 Additional information on the Liquid syntax for the product feed can be found in Creative Template Overview and Advanced Content Templates.